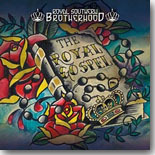 The latest disc from supergroup Royal Southern Brotherhood, may be the best yet among their four releases, making The Royal Gospel an easy pick for this month's Pick Hit. This month's Surprise pick features the new release from The Nick Schnebelen Band, fronted by former Trampled Under Foot guitarist Schnebelen. Our Flashback feature takes a look at a 2010 live show from Delta bluesman David "Honeyboy" Edwards, with a wonderful CD/DVD package titled I'm Gonna Tell You Something That I Know. Our What's New section features reviews of new CDs from Little Charlie and Organ Grinder Swing, The Fremonts, Kenny "Blues Boss" Wayne, Omar Coleman, Eddie Turner, The Bridget Kelly Band, The Mark May Band, Tasha Taylor, Diana Rein, The Hitman Blues Band, AG Weinberger and more, plus a review of a new book, Sliding Delta.